With capacity for 4,914 guests across 13 decks, the 952-feet-long Carnival Splendor is one of the largest ships in the Carnival fleet. Depending on the time of year, Splendor will depart from New York City or Miami, with cruises to Canada or the Caribbean. Upon first glance at the metallic walls covered in pink dots, you may wonder if this ship was built in the 70’s, when in fact it’s relatively young. The 2008 design inspires some to call it the “pink ship,” and you’ll see this hue played out in room decor, as well. The entire atmosphere is vibrant, loud and befitting a “fun” ship, true to the line’s brand. Families are part of the landscape onboard, and children are welcomed nearly everywhere. Camp Carnival provides complimentary, supervised and activity-based care for a majority of the day, and there are plenty of other amenities and activities to keep kids entertained when you’re spending time together. There are 1,503 staterooms on Splendor, and cabin categories include Interior, Ocean View (with or without balconies) and Suites. 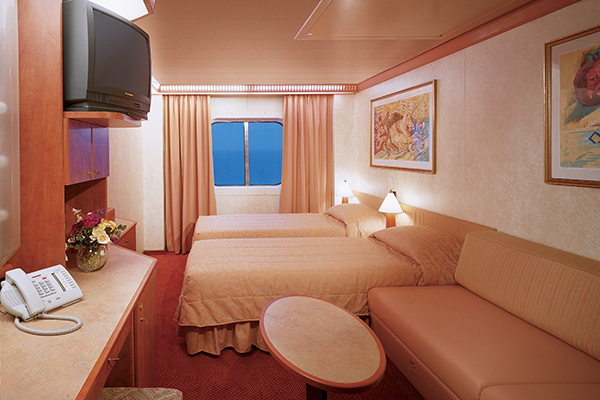 The standard staterooms are 185 square feet, while most of the suites range from 275 to 345 square feet. The Cloud 9 “spa staterooms” are available in all categories, and guests in these rooms get priority access to treatments and services at the Cloud 9 Spa, and use of the thermal suites and thalassotherapy pool. All cabins include TVs with satellite feeds of the major networks and cable movies, as well as a channel showing the view from the bridge, and another showing a map of where the ship is located at any moment. Our kids took great interest in both of these. Each stateroom has a safe and mini-fridge, stocked with a selection of beer, wine, water, juices, soft drinks and alcoholic beverages. We found plenty of strategic storage space, especially under the bed, in the closets, storage cabinets and bedside tables. There is only one electrical outlet on the dresser at the base of the mirror, so you may want to bring a power cord to plug in your gadget chargers. Bathtubs are only available in suites. Hairdryers are standard in all rooms, and shampoo and body wash dispensers hang in the shower stall. There are 934 Ocean View Rooms, which sleep either two or four guests. The majority of the ocean view rooms (537) have balconies. The rooms that sleep two can connect with a neighboring room. A small number (8) have upper/lower configurations, with one twin bed, and either an upper Pullman or sofa bed. There are 577 Interior Rooms that sleep either two or four people, and they all have a full private bathroom. These cozy rooms are priced affordably. An interior with a picture window stateroom sleeps two, and gives you a view out to the observation deck outside with an obstructed sky view. Upper/lower interiors, available with or without a porthole, maximize space for a pair of cruisers, offering one twin bed, and either an upper Pullman or sofa bed. Porthole interior staterooms sleep four, and have a pair of round windows providing a view of the ocean. These rooms can connect. All suites feature balconies, and sleep either three or four guests. Guests staying in suites enjoy VIP check-in, a walk-in closet and a whirlpool tub. Junior Suites are the smallest, and have a standard-size balcony. Grand and Ocean Suites are larger, and Ocean Suites have larger balconies, as well. 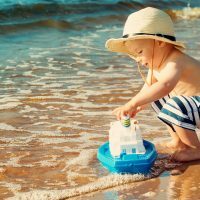 Your kids will likely want to spend the majority of their time in one of the pools, on the waterslide, or in Camp Carnival. But there are family games and activities offered, like digital scavenger hunts, bingo, and towel animal workshops to fill in any gaps. You can also stop in at the Alexandria library for a quiet board game. On the top two decks, you’ll find the City Sports Park with a pirate-themed, nine-hole mini golf course, Ping-Pong, a jogging track, basketball court, and volleyball court. A small video arcade on the Promenade Deck has 22 games, most of which you can play by spending pre-purchased credits on your Sail and Sign card. A signature Carnival program, Seuss at Sea includes a number of activities, including a Seuss-a-Palooza parade. This begins in El Morocco lounge on Deck 5, where everyone gets a prop, such as characters on a stick, red-and-white pom-poms and storybook banners. Seuss characters — Thing 1, Thing 2, Sam I Am and Cat in the Hat – join the parade, which continues down to the Spectacular theater. The parade culminates in Story Time, an interactive reading of “The Cat in the Hat” on stage, where children and parents can sit and participate. There are four pools and seven whirlpools onboard Splendor, each with their own hours of operation, which are listed in the daily FunTimes newsletter. The midship “Splendido” pool on the Lido Deck features a retractable roof–the only one in the Carnival fleet–which allows you to swim in any weather. It’s also where Carnival’s Seaside Theatre shows first-run movies every night, which you can watch from the water or deck chairs while munching on free popcorn. The other pools are the spa’s thalassotherapy pool, the Liner Aft pool (meant to be adult-only) and the Forward pool, which is next to where the 214-foot-long Twister Water Slide ends. Diving is not permitted at any pool, and there are no lifeguards on duty. The children’s water splash park with slides and fountains is located on Deck 11, and is open from 9 a.m. to 5 p.m.
Camp Carnival offers children ages 2 to 11 somewhere to get away from their boring parents. 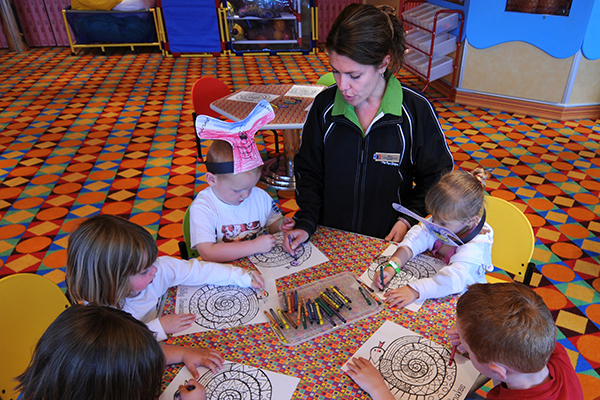 The bright and colorful space on Deck 10 is separated for younger and older children, and within these areas are themed rooms featuring spaces for arts and crafts, dancing, computer games, and more. Camp Carnival holds an open house on the first day so you can check it out with your child. There’s also a youth programs orientation on the first evening that offers more detailed information about the entire program. On sea days, scheduled activities generally run from 10 a.m. to 1 p.m.; 2 to 5 p.m.; and 7 to 10 p.m.. On port days, supervised free play begins from port arrival until approximately 2 p.m.; scheduled activities resume at 2 and run until 10 p.m. The programs are supervised by certified youth counselors. Children must be checked in and checked out by a parent or guardian, and onboard cell phones are provided for parents of younger children. Above and beyond the complimentary programs, the Night Owls program offers nighttime babysitting for children ages 2 to 11 during the hours of 10 p.m. to 1 a.m. for a fee. This service is offered on select nights, and you will get a card in your stateroom the day before listing the theme of each night’s party. The fee on this cruise is $15 per child, per evening, plus a 15 percent gratuity. Circle “C” (ages 12 to 14) and Club O2 (ages 15 to17) are supervised during specified hours of operation, with guided programs and activities like smoothie socials, glow stick parties, and video gaming tournaments. Kids can come and go as they please to these clubs, but do need to be registered at the beginning of the cruise to get an identification sticker. The Cloud 9 Spa is a luxurious space offering body, skin care and salon services. You’ll find traditional treatments such as hot stone massage and microdermabrasion facials, as well as less typical services such as Ionithermie body contouring and teeth whitening. Use of the thalassotherapy pool and dry heat chamber can be added on to your treatment. Special discount offers and raffles are presented on embarkation day. Expect a sales pitch to buy the products during your treatment. Limited spa services for teens, labeled as the ZSpa but provided in the same space, include ice cream manicures and pedicures, “fabulously fruity acne attack” facials, and mother/daughter or father/son massages. The Serenity adult-only retreat is an outdoor area with a whirlpool, lounge chairs and hammocks on Deck 12 for guests 21 years and older. You can find food 24 hours a day onboard the Splendor, and there is plenty of variety – not just in types of cuisine, but in all dining styles, from casual to upscale. In all dining rooms, drink fountains dispense iced tea, lemonade, coffee, cold and hot water, which is included in your fee. Milk cartons are also available. Juice, soda and all alcoholic beverages are available at an additional cost. If your family drinks a lot of juice and soda, you may consider purchasing Carnival’s Bottomless Bubbles unlimited package and pay one flat price for all you can drink. A sticker will be placed on your Sail and Sign card. There are two main dining rooms, the Gold Pearl and the Black Pearl. These are both opulently-designed spaces, and casually-elegant attire is expected. There will be one formal night when dresses and suits are the norm. At the Gold Pearl, you can enjoy a calm, seated open breakfast from 7 to 9 a.m. Dinner here takes place at two assigned seatings at 6 and 8:15 p.m. The Black Pearl was our choice for dinner, because the “Your Time Dining” option allowed us to show up and be seated (as tables were available) any time between 5:45 to 9:30 p.m. The dinner menu will offer several choices for each course, including one comfort food dish and one “Did You Ever” dish with an exotic ingredient. 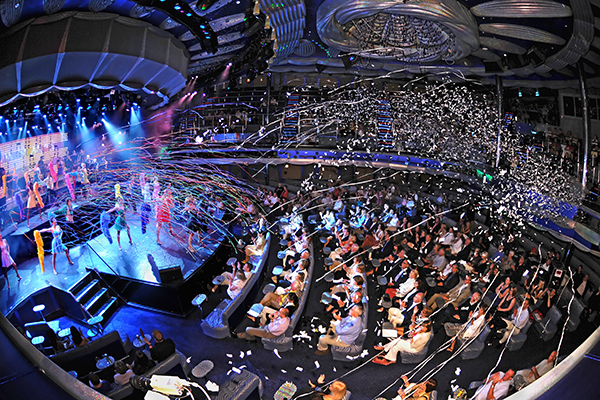 Each night the crew performs a song-and-dance number, and you’re encouraged to clap and sing along. 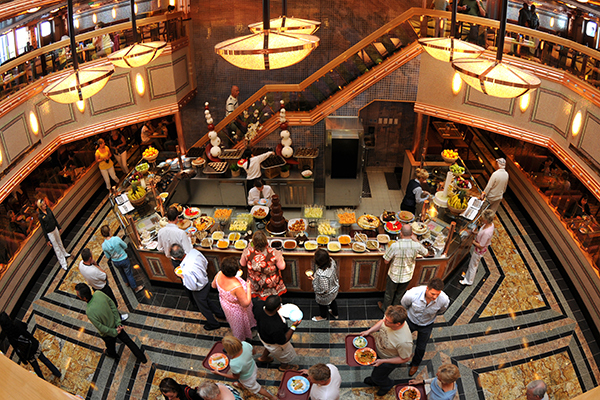 Splendido on Deck 9 is the casual buffet restaurant, with seating options for large families. The breakfast, lunch and dinner buffets are a combination of themed stations, each serving food via cafeteria-style lines. In addition to a salad bar, there’s a made-to-order burrito and wrap station, a create-your-own stir-fry bar, a rotisserie chicken grill, a meat-carving and pasta station, and a dessert table. Set apart from the main stations are the Carnival Deli, Tandoor and Off the Grill, which are often less crowded because of their location. The Pizza Bar on Deck 9, which offers several selections of personal-sized pies, is open 24 hours, and therefore gets crowded after the dive-in movie is over. The only other 24-hour options are room service, and the coffee, tea, and ice cream fountain on Deck 9. The Coffee Shop on Deck 5 offers premium coffee drinks and sweet snacks at an additional cost. It’s open in the early morning hours and again from mid-afternoon to late evening. Room service is available 24 hours a day. It is an excellent option on the last morning of your cruise, when you have to disembark early and don’t want to wake any earlier than necessary to walk down to the buffet restaurant. The limited menu includes cold and hot sandwiches, salads, and desserts. Regardless of which restaurant you end up in, the “Fun Ship” Feast children’s menu is the same, and features the dishes you would expect, such as hamburgers, chicken nuggets, pizza, PB&J, and pasta. Fresh veggies are available as a side. The best value of any of the extras you’ll pay for onboard is the Seuss character breakfast, known as the “Green Eggs and Ham Breakfast with the Cat in the Hat and Friends,” which is just $5 per person. 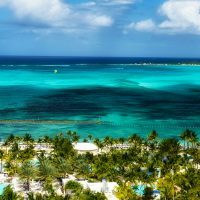 Depending on the length of your cruise, there may only be one offered, so make a reservation the first day of your trip to ensure your spot. Your menu is a fun activity booklet, with space on the back for characters’ autographs. Each of them — The Cat in the Hat, Thing 1 and Thing 2, and Sam I Am — will stop at your table for photos and autographs. While a professional staff photographer accompanies them, this was one of the few opportunities we felt comfortable pulling out our own camera to take our own shots. Menu items include Green Eggs and Ham, Horton’s Cereal-Crusted French Toast, and Truffula Tree Pancakes, among other Seussian dishes. The Pinnacle steakhouse on Deck 11 is the fine dining restaurant. Meals here cost extra, but the quality, service, and atmosphere make the nominal $35-per-person fee worthwhile. Your leisurely four-course meal includes an appetizer, salad, entree with two side dishes, and dessert. Although the restaurant touts an extensive wine list, alcohol is additional. A presentation of the cuts of meat is made prior to ordering, so you can choose your selection along with a complementary sauce. Reservations are recommended, and attire is semi-formal. Carnival has a VIFP (Very Important Fun Person) program for its frequent guests. At the Diamond and Platinum levels, guests receive priority boarding. If you’re not at this level, you can still check in early with the Faster to the Fun (FTTF) package. 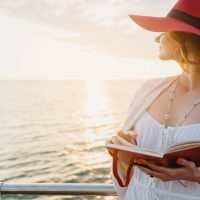 For an additional per-stateroom fee, you skip the long embarkation lines, get the most ship time on your first day, and eat lunch before the crowds descend on the buffet lines. In our opinion, it’s well worth the cost ($50 to $60, depending on cruise duration). During the Safety Briefing at the muster stations on the first day of your cruise, every child 11 years and younger will be issued a waterproof wristband with their muster station number on it. This must be worn at all times. It’s easier than ever to stay plugged in on cruises, and Carnival’s WiFi@Sea program compares well among the industry for offering fast, reliable and relatively affordable high-bandwidth internet service. Wi-Fi packages are based on the types of services guests will be using throughout their trip. For example, guests who are only interested in using Wi-Fi to post to their social networks can purchase the basic Social package at $5 per day. For more service, there’s the Value package at $16 per day. The Premium package we enjoyed at $25 per day even allowed us to access Skype. Carnival recommends tipping $12 per person, per day. The amount is automatically charged to your shipboard account, but it can be adjusted at the guest services desk. The gratuities are distributed among the stateroom, dining room, and alternative services teams. A 15 percent gratuity is automatically added to bar and spa bills. Tips for room service staff is at your discretion. The minimum age for the purchase and/or consumption of alcoholic beverages in the bars, lounges and gift shops is 21. Guests are prohibited from bringing alcoholic beverages on board, as well as water, sodas and other non-alcoholic beverages onboard that are packaged in bottles. Although sundries are available for purchase onboard, they are priced for convenience. Bring your own sunscreen, motion sickness medication, diapers and other toiletries. A limited number of strollers are available to rent from Camp Carnival for a fee, so you may not need to bring one. You’ll encounter the ship’s professional photographers at meals, on deck, and on excursions. You can also schedule portrait sessions with backdrops. When the elephant towel animal mascot was roaming the ship and posed for a photo with our daughter, we weren’t happy about being asked to put away our personal cameras, ostensibly so we would purchase a professional print at the Pixels gallery. The Royal Flush Casino on Deck 5 features slots and other video games, including video poker, as well as table games like blackjack and roulette. You can also play point-earning games like Big Loot Draw, Cash Pong and Take It or Leave It. Bingo games are held in the Spectacular theater throughout the day. After dinner, there are several adult-only spaces where you can relax while the kids enjoy Camp Carnival. You can watch dance shows in the Spectacular theater, catch a Punchliner Comedy Club show in El Morocco lounge, participate in a sing-along at the Piano Bar, or hit the dance floor in the Red Carpet club.